Servings: as many as you need! TIP: This is the same recipe as we use for our potato flour tortillas. Click here for the tortilla instructions. Pizza toppings of your choice. 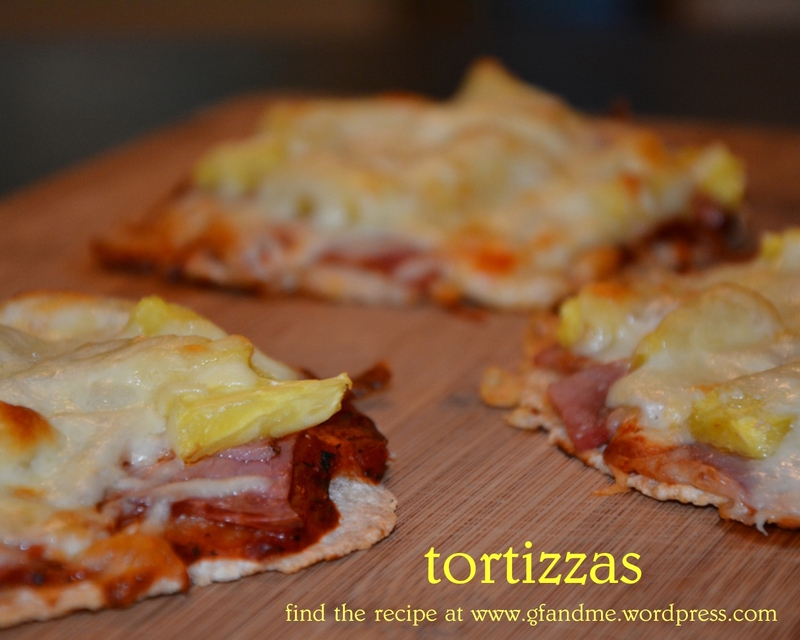 The tortizzas pictured here are each made with 1 slice of gf ham, a few pieces of pineapple and about 1/4 cup shredded mozzarella. Sift dry tortilla dough ingredients together in a large bowl. Using a rolling pin, roll out the tortillas between two pieces of parchment paper. We have even “squished” them flat between two lightly greased flat bottom side plates. TIP: Mix the dry ingredients together in a large batch and store in a sealed container. When you want a tortizza, combine the dry mix with water at a ration of about 2:1, adding water by the tablespoon if needed. In other words, one cup of dry ingredients and 1/2 cup water will make 4 four-inch tortillas, 1/2 cup dry ingredients and 1/4 cup water will make two! Place uncooked tortilla dough rounds on a cookie sheet and top each with 1 – 2 tablespoons of pizza sauce (store bought, your own, or try ours here). Add your favorite toppings and cover with cheese. Bake in 350 degree oven for about 20 minutes – until cheese is melted and browned and “crust” is baked through. The crust will be slightly soft and chewy. This entry was posted in Lunch and Dinner, Recipes and tagged gluten free, Pizza, potato flour, sorghum flour, tortilla. Bookmark the permalink. I know I’ve said this before, but I will say it again; you are a gluten-free genius! I officially declare that tonight will be “Tortizza” night at our house and by the look of these pics, it will definitely be a weekly event from now on! Thank you!! Um… yum. Can’t wait to make it! My supermarket actually has really great gf tortillas but I never thought of turning that into a pizza! These look very easy and very tasty— great idea! Great recipe, they willbe handy to make at uni! Thanks and yes they will!